Ms Erna B. 's three small lemon trees were overwintered in the conservatory. The undersides of the leaves were infested by scale insects, which she treated with Petroleum 30 C.
This is a tip from Christiane Maute's book: Homeopathy for Plants. The plants were sprayed and watered several times every few days with 4 pellets in 1 litre of water. 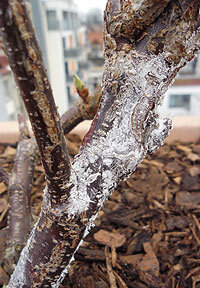 The scale insects, which normally stick to the leaves, could then be easily wiped off; they appeared to be dead. After some time there was a repeat infestation, which could be successfully treated in the same way. In the middle of May, the trees were put out into the garden, and scale insects were again seen on the undersides of the leaves, as well as green aphids on the stems and the axils of the leaves – they were being “farmed” by ants. Erna B. now sprayed and watered the lemon trees every two days alternately with Petroleum 30 C and Staphisagria 200 C, after which the plants were free of pests after 1-2 weeks. The treatment of the troublesome scale insects on my orange trees with Petroleum 30 C has been successful for some time now, following Christiane Maute's recommendation, rather than using the conventional synthetic or rapeseed oil-based sprays. I use 6 - 8 pellets per litre of water. Initially I sprayed the plants with a plastic sprayer, but the results were not good. Since last year I have been pouring the remedy solution onto the trees with a plastic watering can with a sprinkler attachment. This may need more water but it allows the plants to take up the active agent via the roots*. This treatment can be used instead of “normal” watering with plain water. After two treatments in one week (for example, first treatment on Sunday, second treatment on Wednesday, and – in cases of severe infestation – a third treatment on Sunday) the scale insects die off. This can be seen when the insects become dark brown and dried out on the leaves, and can be wiped off, if they have not already been knocked off by the action of rain and wind. * Here it would be interesting to see whether other users also notice a difference between spraying and watering since the homeopathic solution is primarily absorbed by the roots with watering. 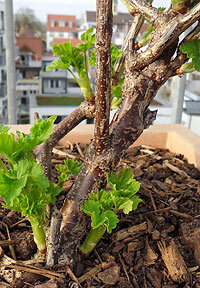 After the long winter, my jostaberries were affected by mulberry scale. The trunk and some buds were covered in a chalky deposit and budding was inhibited. The mulberry scale insect is said to be difficult to treat. Due to the fruits, I wanted to avoid using a chemical spray and was afraid I would have to get rid of the plant. Without any great expectations, I applied 3 pellets of Petroleum 30 C, which I had dissolved in water. Just three days later, the white layer was almost completely gone and the buds were forming again. After a second dose of 3 pellets of Petroleum 30 C, the finally traces of the pest disappeared and the plant looked completely healthy. Cactus (indoor plant) infested with mealybugs. Sprayed at intervals of a few days with decreasing dosage of Coccus cacti. The mealybugs diminished and were completely gone after 14 days. The treatment was done on the days recommended in the planting calendar. Shellac 6D: Scale insects on kiwis (potted plant, outdoors) were treated with Shellac 6 for a severe infestation of scale insects. Treatment was to water and spray twice in one week. The scale insects became fewer and their scales burst open. Ponytail palm was badly infested with spider mite. Dead leaves were removed; but the new leaves were subsequently also found to be infested. The plant was treated once with Thuja 6, with the result that the spider mites disappeared after a few days. 6D: Lyonetiidae moths: These little animals had always left marks on the leaves of my Iberis. The leaves looked like parchment paper and, if badly infested, the plants died. The first time I saw them this year, I watered the plants with Thuja 6D (5 ml /10 liters water) and the spell was broken.